Childs mug in a creamware body. 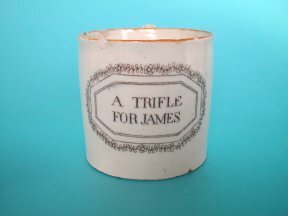 Maker unknown, with transfer printed inscription in grey "A TRIFLE FOR JAMES" probably Staffordshire C.1830. Unmarked. Various chips and small cracks, but a miracle it survived at all ! An interesting and pretty little 'sparrowbeak' jug. Made in a cream coloured pottery body. 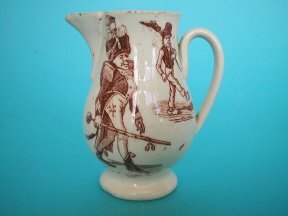 Printed underglaze in brown with what is probably a satirical subject connected with the Napoleonic war. The jug stands only 7.4cm. high and may have been from a Childs teaset. An English Pearlware Plate, c.1820's. A Rare Transfer Printed Pottery Plate. c.1820. 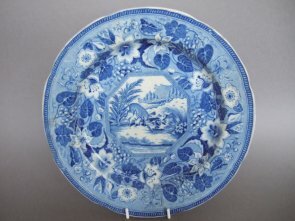 An English pottery underglaze blue transfer printed plate dating from the 1820's. Decorated to the eight lobed rim and cavetto with flowers, fruit and grapes vines. The centre has an octagonal 'Key bordered' reserve with a scene of a stag being brought down by hounds next to a river bank. The back is unmarked except for an impressed circle to the centre. Probably made by J & W Ridgway. Measures 24.5cm. diameter. Good, no cracks or chips. A little roughness to the edge of the rim where the glaze has worn. Typical glaze crazing and very light staining. A rare plate. 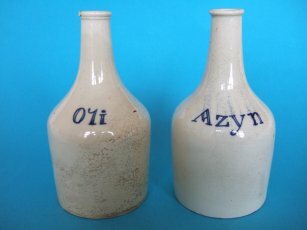 A rare pair of English creamware bottles. Made in England for the Dutch market. They are marked Oli and Azyn, (Oil and Vinegar) in underglaze blue. The measure 12.4cm. high. and 6.5cm. diameter at the foot. Old labels to the base. They date from c.1760-90. Good, just a couple of small chips to the footrims, crazing to the glaze. The oil bottle has also taken in some staining.